Portland, Oregon, Mayor Ted Wheeler on Monday called on the organizers of two "alt-right" events next month to cancel them and allow the city to mourn after two people were killed protecting a Muslim teen in what he called a bias attack. "Please back off and give the families and give this community the space it needs to mourn and process this horrific crime of hate and bigotry and terrorism," Wheeler said, addressing the right-wing groups, during a news conference. Federal authorities have said it isn't clear yet if the Friday afternoon killing of Rick Best, 53, and 23-year-old Taliesin Myrddin Namkai Meche, were acts of domestic terrorism or a hate crime, but Jeremy Joseph Christian, 35, was charged with allegedly stabbing them to death aboard a train. A third person, Micah David-Cole Fletcher, 21, was also injured in the attack and remains hospitalized. George Tscaggeny, 51, arrested in connection with the theft of a backpack and wedding ring of stabbing victim Ricky Best, is shown in this booking photo provided June 2, 2107. Portland Police Bureau/Handout via REUTERS ATTENTION EDITORS - THIS IMAGE WAS PROVIDED BY A THIRD PARTY. EDITORIAL USE ONLY. The men were stabbed after they confronted Christian as he was in the middle of an anti-Muslim outburst targeting two girls, one of whom was wearing a headscarf, authorities said. On Monday, President Donald Trump weighed in on the killings, saying on his official Twitter account: "The violent attacks in Portland on Friday are unacceptable. The victims were standing up to hate and intolerance. Our prayers are w/ them." Wheeler said the organizers of next month's events were "coming to peddle a message of hatred and bigotry." Their opinions might be protected by the First Amendment, Wheeler added, but "hate speech is not protected. As the mayor it's my job to protect the safety of everybody in the community." Wheeler asked the federal government, which he said is responsible for permits at Terry Schrunk Plaza, where the events are planned, to revoke a June 4 permit and deny a second one scheduled for six days later. A spokesman from the mayor's office, Michael Cox, said the Federal Protective Service was likely responsible those permits. An agency spokesman couldn't immediately be reached for comment. The organizer of the June 4 event, real estate investor Joey Bishop, told NBC News that he had no plans to cancel what is being billed as a "Trump Free Speech Rally," and he disputed Wheeler's characterization of the event. "I think he needs to sit down and take a minute and listen to me speak and hear what I have to say," he said. "What he said is completely false." Christian attended a previous free speech rally, held on April 29 and also organized by Bishop, and was captured on video giving a stiff-arm salute. But Bishop said that "Christian has nothing to do with us." "I think Mayor Wheeler is trying to pin Jeremy on us and our movement," he said. Bishop said the June 4 rally will promote standard conservative ideas about lowering taxes and battling gun laws and other elements of the "nanny state." It will also feature Kyle Chapman, a self-described "American nationalist" whose takedown of an "anti-fascist" protester in Berkeley, California, earlier this year vaulted him to cult status on the far right — with the moniker "Based Stickman" — as noted in a New Republic profile published in March. An image posted on Chapman's Facebook page last month showed what appeared to be a crude painting featuring the Muslim Prophet Muhammad and activist Linda Sarsour, who helped organize the National Women's March on Washington and has received repeated death threats over a planned commencement speech at the City University of New York, the New York Times reported. "We took our Mohamed/Sarsour meme to Times Square and turned it into an art exhibit," Chapman wrote. "The local Muslims were beside themselves hah hah!" A "march against Sharia" is scheduled for the same plaza on June 10. The event's organizer did not immediately respond to a request for comment. The American Civil Liberties Union of Oregon actually criticized the mayor on Monday, saying in a statement on Twitter that "the government cannot revoke or deny a permit based on the viewpoint of the demonstrators. Period." A group behind a planned counter-demonstration on June 4, called "Rose City Antifa," also said it had no plans to cancel. "As a group focused on the community, our efforts are centered in the community, not the mayor's office," the Rose City group said in a statement to NBC News. "The Portland community is clearly opposed to this rally occurring, and on June 4th, we will stand against it." During the news conference, Wheeler also said he hoped to memorialize the attack's three victims. 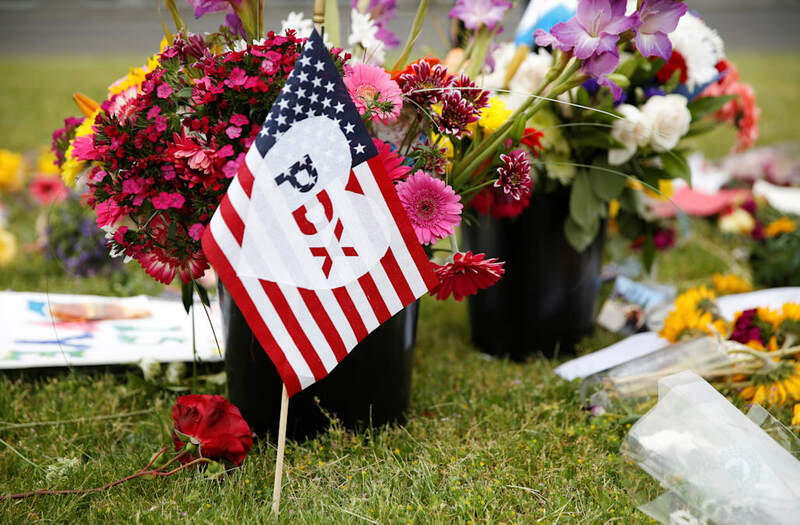 The transit center where the crime occurred was already replete with dozens of bouquets of flowers and moving tributes written in chalk, according to NBC affiliate KGW, but Wheeler said he wanted to make their sacrifice permanent. "This is a seminal moment in this state's history and certainly in this community's history," he said. "The names of those three men, Rick and Taliesin and Micah, they'll be up there with the greats. I don't want future generations to forget that."